Definition of line of symmetry and examples. 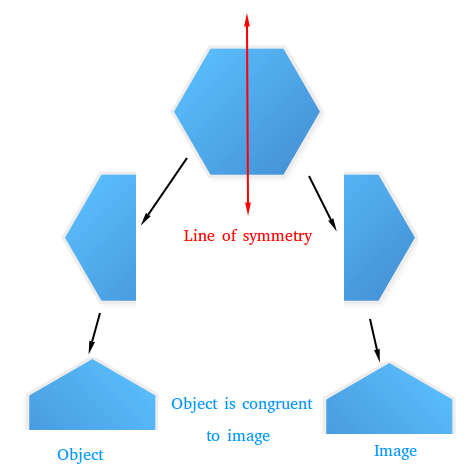 A line of symmetry is a line that divides a figure into two parts that match exactly. In other words, if you can fold a figure so that it has two congruent parts, then the fold line is called a line of symmetry. If the fold line is a line of symmetry, then you can also cut along the fold line until you get two parts ( object and image ). The two parts will be exactly the same as illustrated above. A figure can have no lines of symmetry. This means that there is absolutely no way you can fold or cut that figure so you will get two parts that are exactly the same. For example, notice that the following figure has no lines of symmetry.